EDSA Shangri-La, Mandaluyong City, 29 August 2017 –Epson Philippines once again partners with award-winning designer John Herrera in creating “Armada” - a 30-piece apparel for women for his Spring/Summer 2018 collection. The newest John Herrera creations will be globally presented during Fashion Scout in September 2017, the international showcase for fashion pioneers and UK's largest independent showcase for emerging and established design talent during the 2017 London Fashion Week. Fresh off his win asBritain’s Top Designer 2017 (BTD) at the 5th season of fashion’s finest event for emerging talent in British fashion for his Aguila collection, his first collaboration with Epson, Herrera delves back into history and Philippine pride in creating these new digitally-printed masterpieces. “The inspiration for the Armada collection came from the very first map in history that included the Philippine islands. This map by Diogo Ribeiro shows the world circa 1529.With the help of Epson’s digital textile printing technology, I was able to render parts of this medieval map and present designs on opaque and translucent fabrics.The combination of sheer and stiff materials with soft fabrics create new silhouettes will remind us of sailing to new worlds,” explains John Herrera. As the brand ambassador of Epson Philippines’ Professional Printers Group, he has truly given us the world’s attention with his ingenious marriage of art and technology. 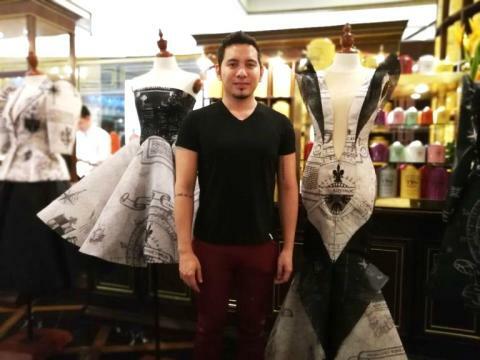 This latest collection called “Armada” is John’savant-gardetake on our history and roots; a creation that we are confident will put the Philippines on the map once again,” said Ed Bonoan, Senior General Manager and Marketing Head, Epson Philippines. Epson’s digital textile printing technology enables designers to achieve their artistic vision with advanced technology that understands the intricacies of fabric and design.With this innovation, world-class designers like John Herrera, have successfully translated their vision onto high quality digital textile prints driven by Epson’s PrecisionCore printhead technology, one of the fastest inkjet delivery technologies in the world. Its print nozzles deliver ultra-precise control of ink droplets for superior image sharpness across a wide range of ink and media, producing outstandingly vivid and unique prints.